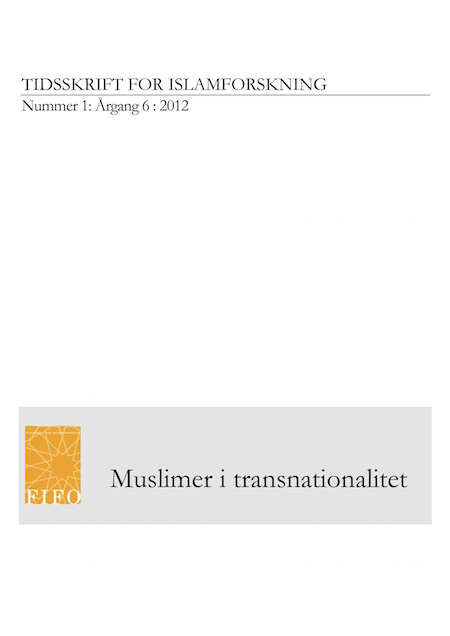 This article analyzes the notion of the transnational Islamic community, umma, as it finds expression in Arabic Friday sermons (khutbas) presented at the mosque of The Islamic Society of Believers (Islamisk Trossamfund) in Copenhagen from 2005 to 2011. Khutbas in which the umma plays a significant role tend to focus on Muslim unity, reform and the role of youth as a catalyst of change in the umma. The analysis identifies a shift in the umma discourse in the Copenhagen mosque from a political Islamist discourse to a more apolitical Salafist discourse. Data presented in the article points to the fact that the notion of how change is generated in the umma undergoes a shift from a nationally and politically oriented focus towards a more globally, ritually and morally oriented focus. The aim of the article is not to contribute theoretically to the study of transnationalism and Islam, but rather to present a case study of relevance to the relation between the two. The content of khutbas in Arabic in Denmark has not previously been the focus of much attention from academics and thus the article also intends to direct attention to a Islamic oral genre that is highly relevant for many Muslims and dynamic in its ability to address topics of religious, political and social relevance. Andreas Lysholt Mathiasen er cand. mag. i Arabisk Sprog og Mellemøstlige Samfundsforhold fra Københavns universitet og har beskæftiget sig med islamisk prædiken i den arabiske verden såvel som i Danmark. Passager i artiklen er uddrag fra specialet ”Fredagskhutbaen mellem religiøs mission og politisk kritik” (2011).